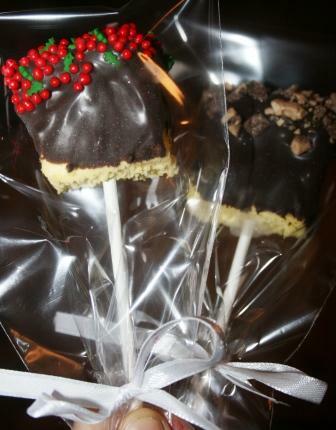 I have been continuing to make baked goods projects as little gifts for teachers, family, and friends. 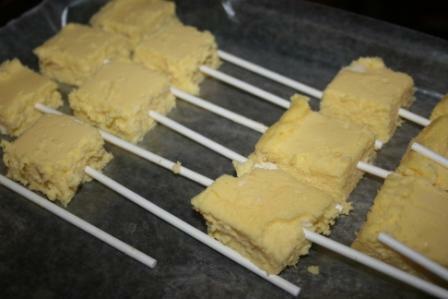 My newest project was cheesecake pops. These are time intensive, but not necessarily difficult. I got the recipe from Woman's World Magazine. Preheat oven to 325*. 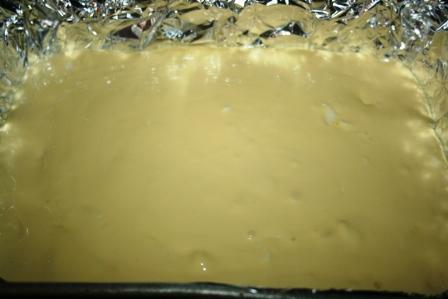 Line 8" square baking pan with enough foil to overhang sides by 2 inches. Coat with cooking spray. On medium speed, beat cream cheese and sugar until smooth, 2 minutes. Beat in eggs, one at a time. Add sour cream, cornstarch, vanilla and salt; beat until smooth and fluffy, 1-2 minutes. Transfer to pan. Bake 40 minutes or until set. Cool 30 minutes. Using foil to help, lift cheesecake from pan; cool completely. Return to pan; cover. Refridgerate overnight. Cut cheesecake into 24 portions. Shape into balls (this didn't go so well for me, so I left them as squares); insert a lollipop stick into each ball. Transfer to a baking sheet; freeze until firm, at least 1 hour. Line another baking sheet with wax paper. 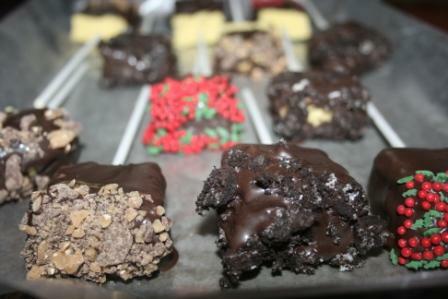 Place garnishes in separate bowls (for garnishes I did holiday sprinkles, heath bar toffee crunch, and crushed oreos). Dip balls, one at a time, into melted chocolate. Let excess drip off, then dip into desired garnish. Transfer to baking sheet. Freeze until ready to serve. These look so yummy! I love the bags too. These will make great gifts. OHHH does JP get some of those delicious looking Cheesecake pops..She got a great surprise in the mail according to her blog.. She has lucky green 4 & 5 leaf clovers at her house. Christmas is so much fun..and I love the surprises that sometimes come my way. Have a great day...ta ta for now..from Iowa. 13 degrees now and a really nice calm day..
Oh my word! I can't imagine having that sort of thing laying around my house! I'd never eat supper! Oh, yum. I'm thinking I may be making the Oreo Truffles today for a MNI tomorrow night. If I can get a minute w/o a not-quite-4-yo under my feet! Oh my Lord, Lisa. Those look sooooo good. Excuse me while I go stuff my face with a good ole Fat Boy ice cream sandwich. It's a poor substitute, I know, but you've just pushed my sweets craving into overdrive. Those look yummy!! Just might have to try these too!! Haven't been around much lately, sorry about that. Looks like you have been very busy and been having a great time!! Great posts! Late Congrats on your 1 year blogoversary! Oh, my hubby would love this being a cheesecake fanatic!